Annabelle will have a stall at Harmony at the Larmer Tree. She will be exhibiting some of her work and demonstrating her skills, painting one of her paintings. This will be a welcome return to The Larmer Tree Gardens, having previously painted at their famous festival for four years in the artist’s quarter and at the Wood Fair. Come and enjoy the Larmer Tree Gardens with its peacocks and magical nooks. This is one of our favourite places to visit! Harmony is a festival run by Arkadia Events and has a number of exciting attractions to keep you occupied for both days featuring music, arts and crafts, not to mention some whacky things we cannot even begin to describe! Come and buy local art and crafts and see talented local people at work. In support of Salisbury Sudan Link fellowship in Faith. Annabelle will be painting all day at this event, so please come along and say hello. It will be a wonderful day and you will be supporting a worthy cause. Rumour has it that my friend, the fabulous Peter Rush will be doing something creative perhaps involving beetle shaped plastic spoons? There will be much more than just us, so come and find out what other exciting things will be happening! Annabelle will have a stall at Tankfest 2015. She will be exhibiting some of her work and demonstrating her skills, painting one of her paintings. She looks forward to these events, loving the atmosphere and chance to chat to people about her work. Come and see her uncanny ability to paint and talk at the same time. And if that is not enough to head over to Bovington, Tankfest itself has a number of exciting attractions to keep you occupied for two whole days! For the first time ever we are able to bring a 38t to Tankfest. This rare piece of historic armour was constructed by the Czechs and had considerable influence in the early campaigns of the Second World War, in the service of the German Army. The tank you will see was recovered from Hungary in the 1970’s and under the last coat of paint were uncovered the markings of the fifth company of the 7th Panzer Division – potentially one of Hoths’ tank from Moscow. The Museum owned, A22B Churchill Mark III AVRE, hasn’t been out in the arena for 8 years. It is currently being restored in our Workshops and will be back in action in time for Tankfest 2015! We will be reuniting three of the four Sherman Tanks that featured in our favourite film of last year “Fury”. Along with our Sherman the platoon will form part of one of the vehicle parades and will also be central to the grand finale battle. There will be an amazing photo opportunity with the three Shermans and Tiger 131 together again in the Tank Park – don’t miss it! The Museum’s Matilda II is being specially restored to run at Tankfest. The Matilda II was known as the “Queen of the Desert”, owing to its dominance of the Western Desert battlefield between late 1940 and early 1941. They went to the North African Desert with 7 RTR in summer 1940 and played a major role in the destruction of the Italian Army in Libya. An original Second World War Spitfire will be flying at Tankfest on both days! Part of the Hangar 11 collection, the Supermarine Spitfire PR Mk XI flew in excess of 40 operational missions over Germany, France and Holland from 1944 to the end of the war. Dan Snow, broadcaster and historian, will be joining guests in the Director’s Enclosure to speak at this year’s Tankfest. 2015 is a year of many significant anniversaries, including the Battle of Waterloo, the signing of the Magna Carta and the end of the Second World War, Dan will be talking about this remarkable year as well as his projects and involvement with The Tank Museum. Dan Snow has researched, written and presented several documentaries on British and World History for the BBC, including the BAFTA award-winning, “Battlefield Britain”. His writing has appeared in renowned publications like The Times, the Guardian, and BBC History Magazine, Dan is also the author of “Death or Victory” – a history of Wolfe’s siege of Quebec. One of the South coast’s most popular swing bands will be attending Tankfest 2015! Swing Unlimited Big Band is a Dorset-based group of jazz musicians, who delight audiences with incredible big band performances. The 10 piece band will be attending for the weekend of Tankfest 2015 in the Entertainment Marquee. Visit their website for more information www.swingunlimitedbigband.co.uk. Real Vintage, based in the South West, travels the country providing entertainment from yesteryear. Prepare to see material from World War One to the golden age of the crooners and the Rat Pack era. The company’s most popular act, the Singing Spiv, will be joining us on the morning of Tankfest, along with his dancers and additional wartime props to keep you entertained. Weymouth-based close harmony singing group, the Decadettes, will take you through the decades with their classics from a variety of different eras, in particularly the 1940’s. Being longstanding friends before colleagues, the chemistry between these ladies is contagious and it won’t be long until you are up and dancing along with them. Annabelle will be painting and exhibiting in Westbourne thanks to Amplifon the hearing aid experts. Such a lovely area to visit with a short walk down Alum Chine for a lovely walk down to the beach and promenade. Lots of shops and cafés to enjoy as well. To complete the day, why not pop in and see Annabelle paint? As well as demonstrating how she paints Annabelle will be displaying some of her work for you to enjoy. Annabelle will have a stall at Warfare Through the Ages 2015. She will be exhibiting some of her work and demonstrating her skills, painting one of her paintings. More details will be added nearer the time. See the history of warfare in action from Medieval to Modern Day with living history encampments, drills, weaponry displays, firearms evolution and period battles. Medieval, Napoleonic, First World War, English and American Civil War, are just some of the periods in history you’ll see brought to life by skilled re-enactors. There will also be TWO arena displays each day, showcasing some of the finest Tank Museum vehicles. See our First World War battle re-enactment as well as a demonstration of Second World War and Cold War tanks. I will be painting in the Corn Exchange all day on Saturday for the Free Expression Arts Festival. I’ll be there between 10am and 4pm so do come and say hi if you are around. A whole host of mostly free events and workshops throughout the day and evening to coincide with Dorset Art Weeks. Visit the What’s On Saturday page for details of what, where and when. A list can also be seen in the gallery window from Wednesday. You will find me alongside the Queen and Queen Mother on the day, pictured here. If you think they are looking a bit pale, that’s because they are fantastic paper mache creations by Peter Rush. 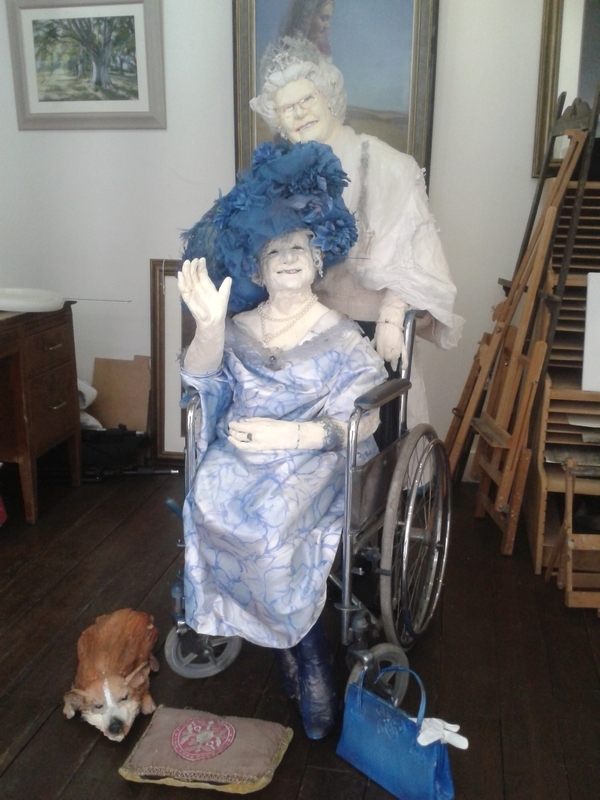 Currently the lovely ladies are residing at the gallery in preparation for the big day. Annabelle will have a stall at The Chalke Valley History Festival 2016 on Saturday 2nd and Sunday 3rd June. She will be exhibiting some of her work and demonstrating her skills, painting a work in progress. The Chalke Valley History Festival is a true celebration of the past. Offering a unique blend of talks, discussions & debates alongside a vast living history through-the-ages encampment and stunning historic air show, ours is a festival like no other. Set in fields in south-west Wiltshire, the festival’s home lies in an idyllic part of the world. Here, chalk downs, etched by ancient droves, overlook lush farmland and, during the week-long festival, a large encampment. It is a stunning spot – where an ancient English landscape meets Hardy’s Wessex. And for one week at the end of every June, this normally sleepy corner of England comes alive to the sound of Merlin engines, cannon-fire, muskets and music. Whether young or old, there is much on offer at this truly unique festival of history. There will be hearing loops installed in the front half of each of the three event tents. The Festival site is on a working farm, the nearest village is Ebbesbourne Wake. The nearest towns are Salisbury (14 miles to the east) and Shaftesbury (12 miles to the west) and Blandford (18 miles to the south). Please follow the signs to the Festival rather than your SatNav. Trains run to Salisbury every 1/2 hour from London (please allow at least 45 minutes to the Festival) and every hour to Tisbury (25 minutes from the Festival). Number 29 bus runs between Salisbury and Shaftesbury. There is a request stop in Ebbesbourne Wake – ask to go to Manor Farm. The walk to the Festival is about a mile.